Source: CICH graphic using data adapted from Statistics Canada. Table 206-0011 – Market income, government transfers, total income, income tax and after-tax income, by economic family type, Canada, provinces and selected census metropolitan areas (CMAs), annual. http://www5.statcan.gc.ca/cansim/a26?lang=eng&retrLang=eng&id=2060011&&pattern=&stByVal=1&p1=1&p2=31&tabMode=dataTable&csid= – accessed March 18, 2017. Between 2010 and 2014, the median after-tax income* among Canadian couples with children rose by 6.5%. That change was only 2.4% for lone-parent families. There were great differences between the provinces. 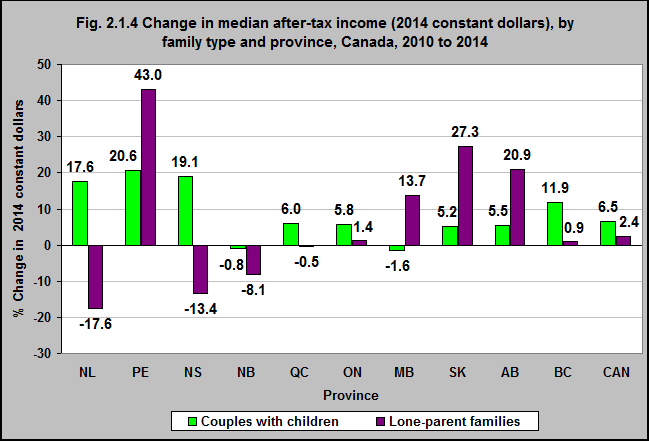 In Prince Edward Island the median after tax income increased by 43% for lone-parent families and in Saskatchewan it increased by 27%. In Newfoundland and Labrador, Nova Scotia and New Brunswick those incomes decreased. *The concept of income covers income received while a resident of Canada or as relevant for income tax purposes in Canada. Market income is the sum of earnings (from employment and net self-employment), net investment income, private retirement income, and the items under other income. It is also called income before taxes and transfers. Total income refers to income from all sources including government transfers and before deduction of federal and provincial income taxes. It may also be called income before tax (but after transfers). After-tax income is total income less income tax. It may also be called income after tax. The median is the level of income at which half the population has higher income and half has lower.